I’m a long-time resident of OB, and I have been covering the increased amount of hate crime and hate speech in San Diego County in recent years. In that connection I wanted to present some highlights of the recent Hate Crimes Summit sponsored by United for a Hate Free San Diego at El Cajon’s Ronald Reagen Community Center on Thursday, October 1, 2009. Hate crimes, hate groups and hate behavior are proliferating across the U.S. according to James McElroy, CEO of the Southern Poverty Law Center(SPLC). He delivered the keynote address to an overflow crowd at the Summit, recently. there is strong anti-immigrant sentiment spewing forth from major radio and television networks like CNN and Fox. To counter this growth in hate crimes, etc., the SPLC has a very comprehensive educational program which presents “Teaching Tolerance” materials to the schools, a Monthly “Intelligence Report” to over 60,000 people involved in law enforcement around the country, and short documentary videos on hate crime, hate behavior, and hate groups to many non profit organizations. There, also, is a growth of Hate Groups across the country. In the past year they have risen from 888 to 926, with 84 of these Hate Groups in CA, and most of these in Southern California. He, also, indicated how the SPLC has been successful in suing many of these groups, helping to put them out of business. With this growth in Hate Groups in our area in recent years, the number of hate crimes has risen.25% in 2007 in the city of San Diego , and 35% in the county of San Diego , according to the latest FBI statistics. The incidence of hate crimes against Hispanic Groups in this county has tripled in this same time. 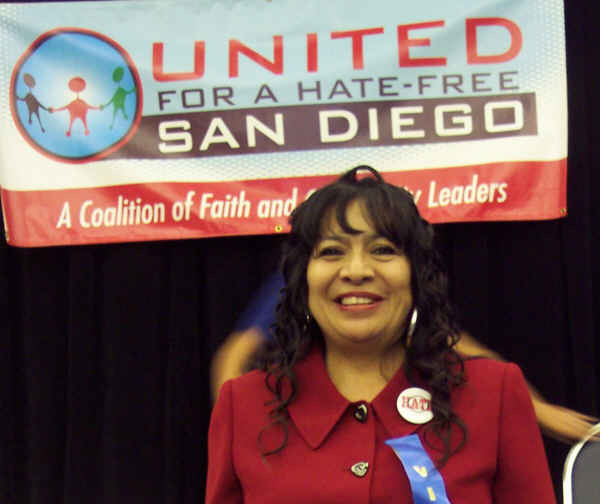 In fact, it was the incidence of discriminatory behavior against immigrants during the fires in San Diego County just a couple of years ago that pointed to the need to build this interfaith coalition of leaders who would go out into the community to counter the hate crime with education. It has now grown to 72 civic and clerical organizations, and has presented to, and received endorsements from, the San Diego City Council, the San Diego Area Governments organization, and many City Councils around the county. Raffi Aftandelian of Plan of Action in a Changing Era and author Falchi. 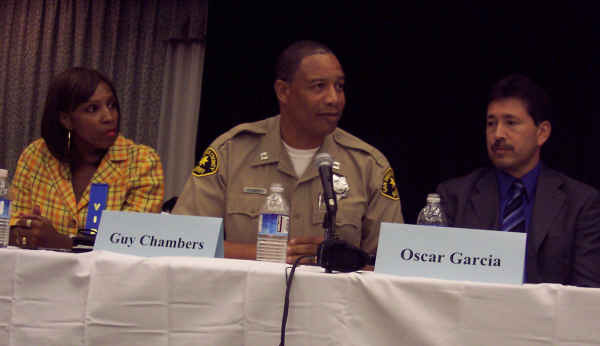 This gathering, also, included a panel of experts, consisting of: Deputy Commander of the San Diego County Sheriff’s Department, Gary Chambers; Deputy District Attorney, Oscar Garcia; parent of a student who had been attacked, Denise Brown; Educational Advocate and former School Principal, Marge Cole; and human rights advocate, Morris Casuto, of the Anti-Defamation League. The panel chose not to give set speeches, but instead answered questions from the audience and from M.C., Rev. Ikenna Kokayi, CEO of the United African Ministerial Action Council, who posed some case study scenarios to the panel. He was assaulted and beaten by five males, near the school, and paralyzed from the neck down; that was national news, featured on 60 Minutes. The Sheriff was involved and two kids wee prosecuted, not for attempted murder, however, maybe assault, they spent a few months in jail. They received slap on the hands. A more recent incident occurred in October 2007 at West Hills High School . It took place on campus against an African-American student. The student was severely beaten and needed reconstructive surgery. Why was he beaten? They told him because he was a n****r and they didn’t like him. It was a White Supremacy group. It was even reported to the Sheriff’s Office. The worst part is that the school didn’t do anything. So it went to an attorney and there was a settlement. This is the reason I’m so angry. Nothing was done. People are treated differently here due to language barriers and cultural issues. I have three kids–17, 21, 23. I was widowed three years ago. I think it just made me stronger. I’ve always faced oppressions, being a woman, being of color, and coming out of poverty. I’ve made that oppression a strength. That resonated with me. I knew some people were treated differently. In fourth and fifth grade, white students would throw rocks and tell me to go back home. Tears were forming in her eyes at the memory. It was very hurtful to me…it became something in me, my drive to do something. It’s not right for one person to be valued more because of the color of their skin. After receiving her Sociology degree from San Diego State University , she returned to her high school in Brawley to implement a migrant outreach program. “I was empowering people. I enjoyed that role,” she said. In later years she worked in a healthcare clinic, a mental health facility, as a juvenile hall group supervisor, and as a housing specialist in Santa Clara before moving to San Diego . She is also passionate about helping immigrants, having traveled to Chiapas , Mexico , and seen children with bellies bloated from starvation and met women worried that their men, who have gone to the U.S. in search of work, may never return home due to the dangers that they face. “I see the injustice, the sacrifices and hard work in these families just to be respected in this country,” said de los Rios, who is determined that no child should suffer racial or hate-motivated violence in East County . Her work, currently, includes advocacy on behalf of those affected by human trafficking and immigration. She serves on the boards of Borderlinks and Empower San Diego, and is an international leader for Justice Overcoming Boundaries. She points to some success stories, such as a program that she has presented for the Anti-Defamation League to teach tolerance to students. She has sent letters to Grossmont Union High School District Superintendent Bob Collins asking to present the program in local high schools, but said she has not received a response. On the date of our interview there was a trial of the man who attacked Rhythm Turner, the gay musician assaulted for being gay, in Pacific Beach . “That, too, was not charged as a hate crime,” de Los Rios noted. 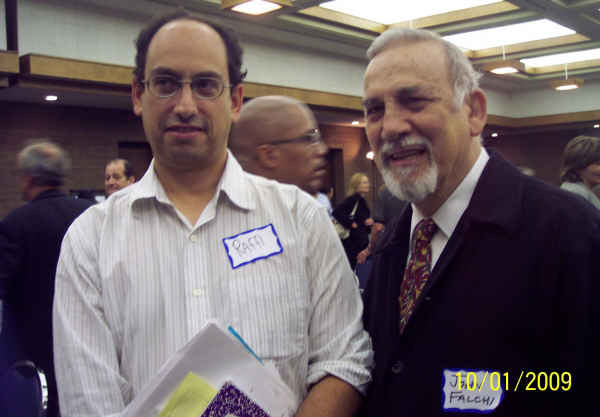 John Falchi, an educator most of his life and, has served on the boards of a number of major non-profit organizations, and has been very involved in the renovation of the First Unitarian Universalist Church of San Diego. Last year John won the “Shameless Agitator” award from the Church. Because San Diego, despite being on the “left coast” has evolved into a pocket of redneck/fundie/conservative intolerance hiding thinly beneath a surface of self declaration as “America’s finest city”. Of course as stated this is a nationwide tragedy going on, especially after 9/11, but it is very strong here. Google “organized stalking” (or cause stalking, gangstalking, community mobbing) it goes on wherever rednecks fearful of the future are flailing at some form of control of the things within their arm’s reach- and San Diego seems to have many cases as it was first surfacing in the early ’90’s. Dallas, East SF Bay,Ohio, Pennsylvania, Florida, New Jersey and Arizona also seem to be magnets of this “neighborhood watch becomes Bush’s Orwellian nightmare” but San Diego must have some factors that make this new hobby for closet sociopaths appealing. I’m glad someone brought up Westboro. Those folks are the worst of the worst. They make young children take part in their hate fests, protesting funerals of soldiers killed in action, those who have died of AIDS related causes, and even just anyone who they think happens to be a “gay enabler”. Lately they have been targeting Jewish institutions, for some unspecified reason they have moved away from military funerals, and I’m hoping that San Diegans will do the best thing here and just simply ignore them. Thank you for this article and coverage. You’ve shined a bright light on the area’s darkest, but hopefully improving, issues. Lane, I am troubled by the recommendation for us to ignore Westboro. They are going to be outside of San Diego High School on one of these dates. What are high school students going to think when they see only these protesters, and no other adults out there advocating a different position? I don’t want my or our silence/absence to be construed as complicity at the high school and the synagogues. Enjoy these people while they last. Know that on Sunday they preach “love your fellow man” then Tuesday it’s all about “God Hates Fags”. If you cannot see the humor in it you are missing out. Anyone want to pretend to be part of them and make protest signs that say “I Hate Crowds” or “Religion Can Be Hypocritical”? I don’t know how I feel about the Westboro issue. They are planning on protesting outside my office next week. I have a responsibility to the people I serve to make sure they feel safe, then worry about the protest. So in many ways I am being forced to ignore them to insure they don’t completely nullify our daily services. On the other hand, I wish I could chuck tomatoes at them. I’m just not sure these folks are even worthy of it. They are so twisted, they are planning on protesting the Rock Church…..for “enabling gays”. If there ever wasn’t anything so ironic…..
the fact is that there are about 20 westboro members (many of whom are related to its pastor) that travel around the country and picket. i’d be interested in opposing them if there was any sign of local participation. but as it stands now, they are a handful of wingnuts (and I’m pretty sure that they’re too far out for most of our local flatearthers) hoping to get media attention by getting US to counter-protest. I think we have to pick our fights carefully, and, as disgusting as these people are, they are better off ignored. Westboro is going to get media attention whether we show up or not- “if it bleeds, it leads” and hate will be bleeding all around. The Patriot Guard Riders have had great success in shutting down these protests by just making a bunch of noise and basically surrounding the groups of protestors and revving their engines. I still think “Highway to Hell” would be a more appropriate course of action. Also, Michael Moore had his own unique way of confronting these guys…this is goooood…..
Jon- thanks for the Moore clip. I could get behind making some noise. I understand what Doug is saying about picking battles carefully and my conscience continues to dictate that I show up at some of the protest sites. The high school. The agency where our fellow Ragster Lane works, an agency which provides so much assistance to my neighbors in City Heights. LOL, that moore clip was so funny I thought it might have been some MAD TV parody or the like, (and I thought moore was taller than that) but a little research confirmed it was from moore’s own TV show “the awful truth” thus the laughtrack. I had done some looking several years ago into the life of Fred Phelps, he is a bigger than life individual, scary and formidable in many ways yet a pathetic wretch guilty of many excesses and sins. I think his life might make a great movie in a sarcastic black comedy way. He won the Kansas State Golden Gloves Championship in his weight class by knocking his oponent out cold in the first round. Later in life, as an attorney, he was similarly feared by filing and winning lawsuits against those who tried to silence his church’s views- including taking the home of the Topeka Police Chief who “wrongfully” arrested him. He took on many racial discriminatory cases for blacks pro bono and won them- but according to one of his daughters would put his own plaintiffs on the stand and trick them into repeatedly including in their testimony the letters “DN”, (standing for “dumb n*****”) which he convinced them were a necessary legal term. He once killed a dog who urinated on the grass of the WBC, with a shotgun- in front of witnesses including a little girl. He was a Fagin-like father who sent his many children out to engage in petty con artist crimes to support the family. One of the scemes involved the sale of candy door to door, the candy supplier was one of those used by schools and fund raisers, when Phelps ran a bill up into the thousands of dollars and did not pay, the supplier sued Phelps. Phelps countersued, and won- including legal fees for his own services. He was addicted to amphetamines and alcohol and would beat his wife and children, until one weekend in the ’60’s where after a long binge he purged his addictions voluntarily. On top of the ridiculous campaign of hate by picketing funerals, you can see all of this if dramatized in a macabre way would make a hit movie in a country where Jerry Springer gets good ratings.